1	 Sunport Delfzijl	 30.00	 123000	 Delfzijl	 Field	 F.O. F.O. F.O. F.O. 2	 Zonnepark Veendam	 15.50	 57250	 Veendam	 Field	 F.O. F.O. F.O. F.O. U.C. Zonnepark Groene Hoek	 15.00	 250000	 Hoofddorp	 Field	 F.O. F.O. F.O. F.O. 3	 Zonnepark Lange Runde	 14.00	 118000	 Emmen, Drenthe	 Field	 F.O. F.O. F.O. F.O. U.C. Zonnepark Middelburg	 14.00	 55000	 Middelburg, Torenweg	 Field	 F.O. F.O. F.O. F.O. U.C. Stadskanaal 'Bedrijventerrein'	 13.90	 N/A	 Stadskanaal	 Field	 F.O. F.O. F.O. F.O. U.C. Zonnepark Emmeloord	 12.40	 43500	 Noordoostpolder, Emmen	 Field	 F.O. F.O. F.O. F.O. 4	 Zonnepark Woldjerspoor	 12.00	 43000	 Woldjerspoor, Groningen	 Field	 F.O. F.O. F.O. F.O. U.C. Zonnepark Avri Solar	 9.30	 34000	 Geldermalsen	 Field	 F.O. F.O. F.O. F.O. U.C. Royal Dekker	 9.30	 35000	 26 locations	 Roof	 F.O. F.O. F.O. F.O. 5	 Zonnepark Ameland	 6.00	 23000	 Ameland	 Field	 F.O. F.O. F.O. F.O. 6	 Zonnepark XXL, TT Circuit Assen	 5.80	 21	 Assen, Drenthe	 Field	 F.O. F.O. F.O. F.O. 7	 Solar Campus Purmerend	 5.60	 21600	 Purmerend, Noord-Holland	 Field	 F.O. F.O. F.O. F.O. 8	 Rhenus Contract Logistics	 4.50	 15000	 Eindhoven	 Roof	 F.O. F.O. F.O. F.O. 9	 ABC Westland Agri & Food	 4.16	 16000	 Poeldijk, Zuid-Holland	 Roof	 F.O. F.O. F.O. F.O. U.C. Zonnepark Apeldoorn	 3.60	 11000	 Apeldoorn	 Field	 F.O. F.O. F.O. F.O. U.C. Zonnepark De Zwette	 3.60	 13000	 Leeuwarden	 Field	 F.O. F.O. F.O. F.O. 10	 Tesla Factory Tilburg	 3.40	 10800	 Tilburg	 Roof	 F.O. F.O. F.O. F.O. Access the full top 25, including all available project details, please complete the form at the bottom of the article. Looking at the utility-scale market for Solar PV in the Netherlands, we see a quickly growing market in terms of number of projects and size per project. When comprising a list of the top 25 projects (including projects currently in the very final stages of construction), the list encompasses 176 MW of solar capacity or around 7.05MW per project on average. This is a significant increase compared to recent years. The largest project is now situated in Delfzijl with 30MW generating capacity, compared to the 6MW Ameland project on top of last year’s list. Two years ago, in February 2016, Solarplaza compiled a similar list with the 25 largest projects in NL. Back then, the total size of the list was just 36 MW, with an average size per project of 1.4 MW. All in all, it’s clear that we’re looking at a huge expansion of the market. Also, the list with the largest and most prevalent developers has changed almost entirely, as well as the locations of the largest plants. Furthermore, the total amount of solar panels used in the 25 largest projects currently stands somewhere between 575,000 and 925,000 modules (depending on whether we take the projects that are under construction and nearly finished into account or not). Two years ago this figure was still just 200,000. What’s also interesting, is the increase in large ground-mounted/greenfield projects. Traditionally, the Dutch large scale solar PV market has been dominated by large industrial roof projects. However, with more and more developers and assets owners utilizing the obtained SDE+ subsidies, the development of larger field (and roof) projects has become increasingly attractive. This slow shift has been on the rise over the last years and is now starting to result in a balance between the two types of projects. In terms of installation components, a large variety of suppliers for the solar panels have been used to realise the projects, with no single producer claiming a dominant share of all the projects. In the case of inverters though, SolarEdge and SMA are the most frequently returning names. However, not all data about the components is known for the entire list of projects. Ownership of large projects is widely distributed, with Groenleven being the most prolific asset owner, being involved in a multitude of projects. More and more parties are starting with private asset management initiatives. Companies with distribution or production centres, like Royal Dekker, ABC Westland, Tesla’s Tilburg factory, Nissan, Wehkamp, Thyssenkrupp and Heineken, all made it to the list of Top 25 projects. Large foreign companies are now also recognizing the Netherlands as a key European solar PV market for the next years. The very recent entry of Statkraft en Belectric, the companies involved in the Zonnepark Lange Runde project of 14MW, is a clear example of that. Another observation, is that utilities are starting to get more actively involved with the projects by becoming offtaker of the electricity and selling the electricity to other companies. Google for instance is buying the power generated from the largest solar plant in NL to date in Delfzijl. Furthermore, it is interesting to see the province of Gelderland emerging as home to the biggest number of large-scale PV projects, especially once the projects in advanced stages of construction will be delivered. Whereas residential solar is mainly prevalent in the highly populated areas, solar fields are (logically) easier to realize in areas with more open space available. Recent reports state that more (foreign) developers are approaching farmers to make use of their land to develop projects, which can be an interesting and lucrative opportunity for the farmers. While the majority of the projects are functioning well or reaching COD as planned, there are also projects in the list that have bumped into unexpected challenges. For instance, there are reports stating that solarpark Azewijn, occupying spot 25, has been malfunctioning and not operating at maximum capacity for several years now, ever since a fire damaged the park in 2012. A completely different type of inhibiting factor, is the capacity constraints that large Dutch net operators are dealing with. Zonnepark Middelburg for example, completed construction several months ago. However, the solar park still isn’t delivering electricity to the grid, as it is still waiting for grid connection to take place. The Dutch PV market has quickly accelerated over the last year and will continue to do so at a rapid pace over the coming year. There are many large scale projects in various stages of development, using the governmental SDE+ subsidy. 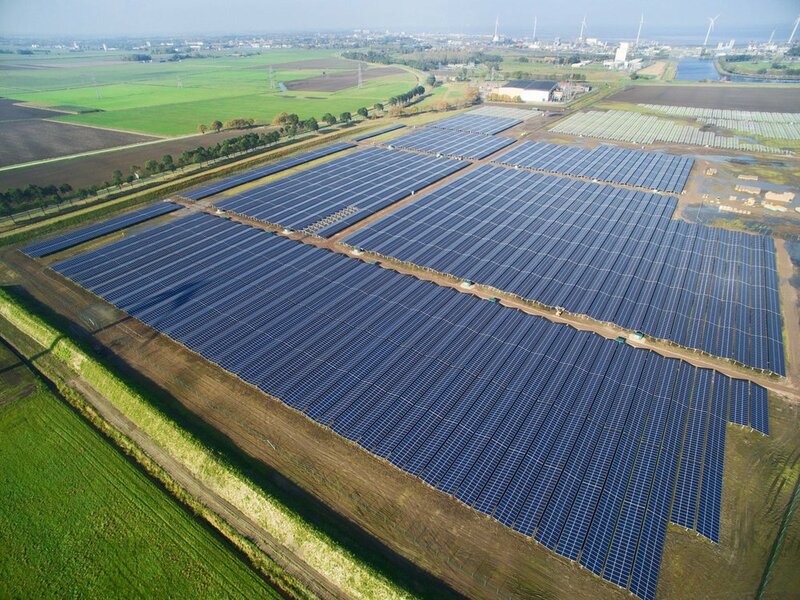 Where the year 2017 saw a record of 853 MW of new solar capacity additions, in 2018 the Dutch PV market will exceed 1 GW of newly installed capacity, making this is the perfect time to enter the market. In a local market like The Netherlands, there are ample opportunities for experienced (foreign) parties to step in and contribute much-needed capacity and experience to the industry, in order to keep up with the growth in PV projects. We would like to welcome you to the The Solar Future NL on the 17th of May to explore the Dutch PV market further, and utilize the largest networking & inspirational platform for market leaders in solar energy!